Easter Mediation: He is Risen. Easter: The culmination of Lent and Holy Week is of course Easter but our celebration cannot be exhausted in one day. 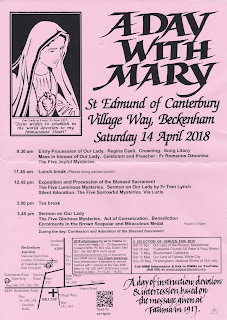 Therefore, Mother Church gives us a week’s Octave when we celebrate more solemnly, and then 50 days until Pentecost (20th May); so that we may truly savour and experience the implications of the Resurrection in our own lives. Happy Easter to you all. Frs. Christopher, Przemek, Romany, Andrew, Gabriel & Mgr Leo. Thursday 12th: 10am Patricia Reid. Wednesday 18th: 12pm Eileen McGinty. Friday 20th: 11.30am Nora Christine Egan. 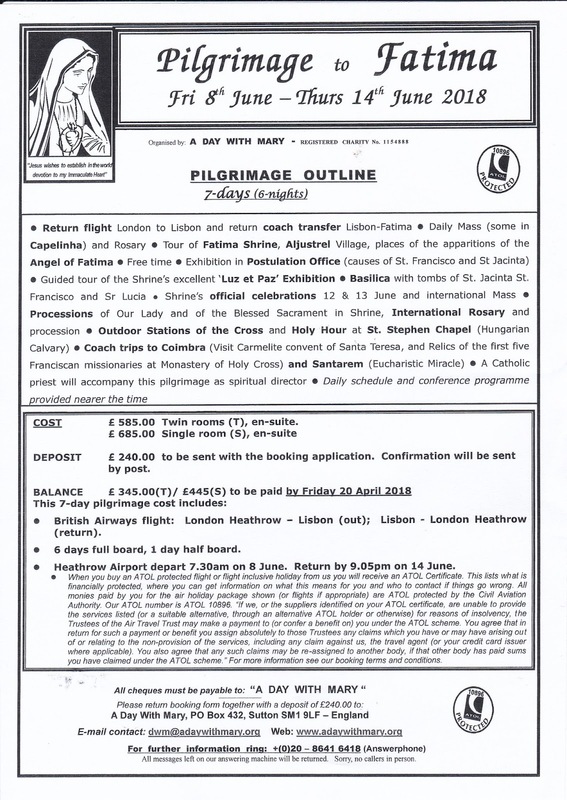 New Readers Rota (April-June): The new rota begins next weekend so don’t forget to pick up your copy of the rota in the porch. 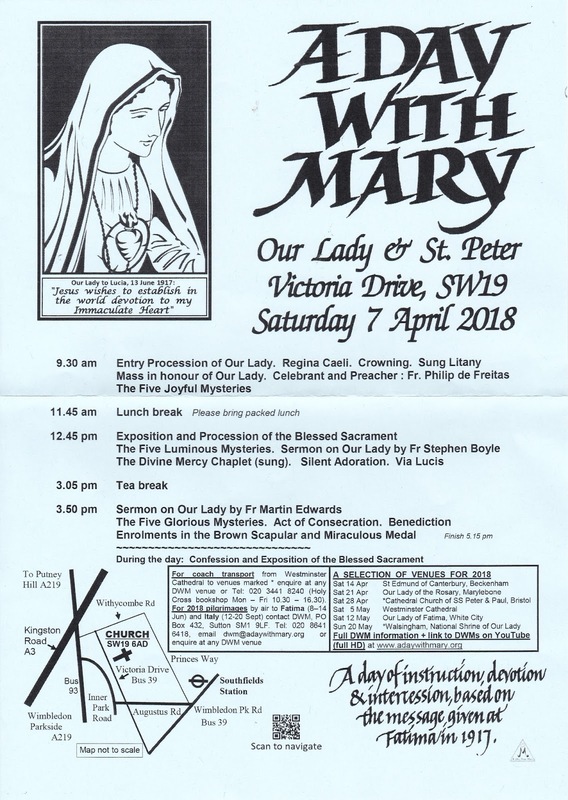 A Day with Mary - Our Lady & St Peter Church, Wimbledon Common on Saturday 7th April. 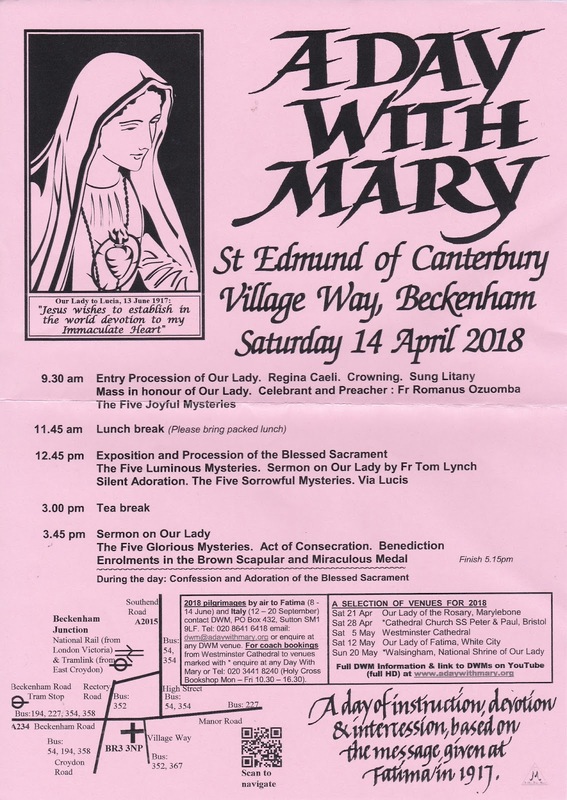 St Edmund of Canterbury, Beckenham on Saturday 14th April. 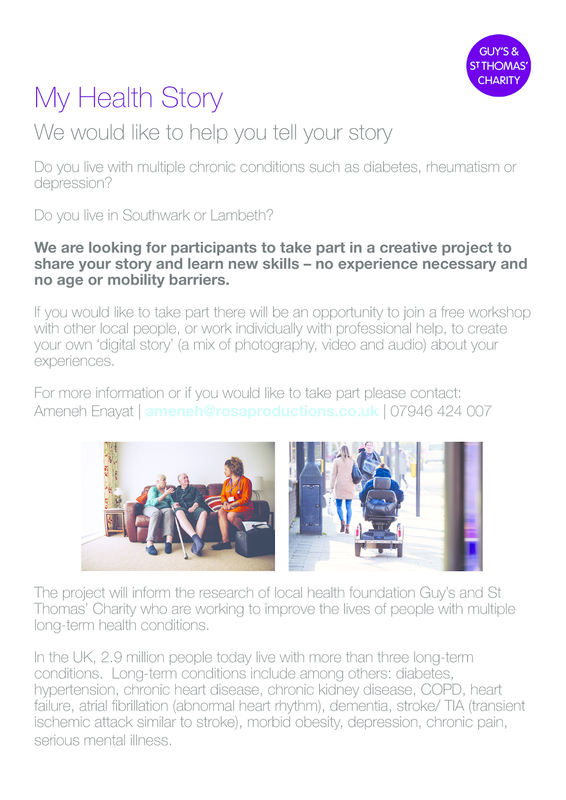 See posters for more details. 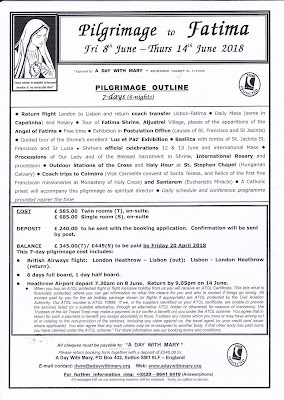 They also have a 7 day pilgrimage to Fatima in June. Costs £585 for twin-room en-suite or £685 for single room en-suite. See poster for more details. 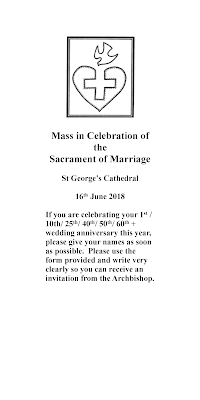 Mass in Celebration of the Sacrament of Marriage: If you are celebrating your 1st /10th/ 25th/ 40th/ 50th/ 60th + wedding anniversary this year, please give your names as soon as possible. 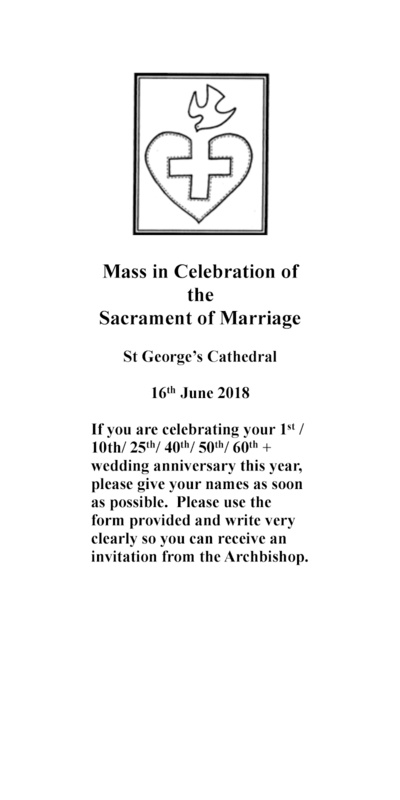 Please use the form provided at the back of Church and write very clearly so you can receive an invitation from the Archbishop to the Mass in June. Cleaners this week: Ellen Asafu-Agyei, Adiam Berhane & Pauline Ajuga. 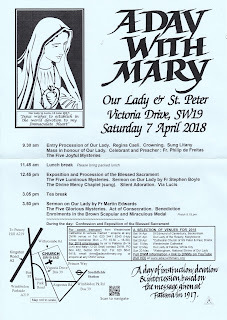 London SW Catholic Young Adults is a social group for young Catholics which meets every month. For further details visit our Facebook page or contact Miles on 07790 441242 Our next social evening is on Saturday, 7th April at 7.00pm at The Gourmet Burger Kitchen, Waterloo, SE1 8UL. Vacancies: To find out more about these vacancies, see posters on the notice boards or CLICK HERE to be directed to our Job Opportunities page. Exam Invigilators Required (Bishop Thomas Grant): Immediate start. Exam Invigilators Required (Ursuline High School): 14th May to 26th June. Exam Invigilators Required (St Philomena's): Immediate start. 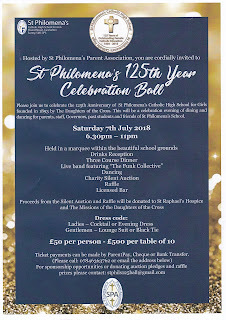 St Philomena's 125th Year Celebration Ball: Please join us to celebrate the 125th anniversary of St Philomena's Catholic High School for Girls founded in 1893 by The Daughters of the Cross. This will be a celebration evening of dining and dancing for parents, staff, Governors, past students and friends of St Philomena's School. Saturday 7th July 6.30pm to 11pm. Dress code will be formal. See poster for more details. Lift up your heads, O Gates! - Tuesday 10th April 2pm; Monday 23rd April 6pm. Starting at the Church of the Precious Blood, The Borough. The King's Good Servant - Tuesday 1st May 6pm. Starting at the Church of Our Most Holy Redeemer, Chelsea.